Single-serving coffee capsules may be convenient. But these pre-packaged pods are bad for the environment and your wallet. How much is pre-packaged coffee worth? A latte. Since Keurig's introduction in 1998, coffee pods have traded on our need for instant gratification. Pop one in, press a button, and less than a minute later: delicious elixir of life. Nothing to prepare or clean up. Once the bin of your machine is full, simply dispose of the empty pods. Until September 2012, Green Mountain Coffee Roasters held the patents for single-serve coffee pods for Keurig brewing machines, commonly known as K-cups . These pods represent over 26% of the U.S. market for ground coffee. Green Mountain estimated that 16-17 million households will have a Keurig by the end of 2013. In the 13 weeks before Christmas 2011, Green Mountain sold over $715 million worth of K-cups. Single-serve coffee makers represent roughly 46% of espresso and coffee machine sales. So there's a lot of money in coffee pods. And you know what they say about money and problems. In 2012, Green Mountain sold about 5 billion K-cups. That means several billion single-use foil, paper, and plastic capsules went straight into landfills...and our oceans. Plastic pollution is a major environmental issue: 90% of marine debris is from disposable plastics. The Great Pacific Garbage Patch was the subject of a 2010 Tedx talk. Plastic coffee pods aren't biodegradable. The multi-material structure fuses several components, which is "incredibly difficult or impossible" for recycling plants to process. But that's only one piece of the problem. Coffee pods are too small to be captured by most facilities that sort by size and density. And depending on the type of plastic used, many communities many not even accept coffee pods for recycling. Coffee pod manufacturers are aware of the issue, and have made some attempts at greenwashing. Unfortunately, the solutions sound about as effective as plugging a leak in the Hoover Dam with a band-aid. Reusable pods are available, but that involves fussing with grounds and clean-up, the very activities single-use pods were designed to avoid in the first place. Recycling company TerraCycle has partnered with Tassimo, Mars Drinks, Nespresso, and Illy to develop customized take-back programs, diverting pods away from landfills. (Keurig runs its own recovery program, but it'll cost you: $50 for 5 small bins, $100 for 5 large.) Albe Zakes, TerraCycle's global VP, estimates TerraCycle has collected roughly 25 million coffee capsules since 2009. Pod sales are measured by the billion. Programs of this nature also expend energy at multiple points. Customers drive to a designated site to drop off their used pods. The pods are shipped to a processing center, and downcycled (not recycled) into low-grade uses like "pavers and composite lumber." Packaging is the most visible form of waste, but an analysis run by Keurig found that the pods themselves represent only a small portion of the total environmental impact. Even more waste is associated with the production of these tiny, convenient, and totally unnecessary plastic cups. Coffee pods make inferior coffee. 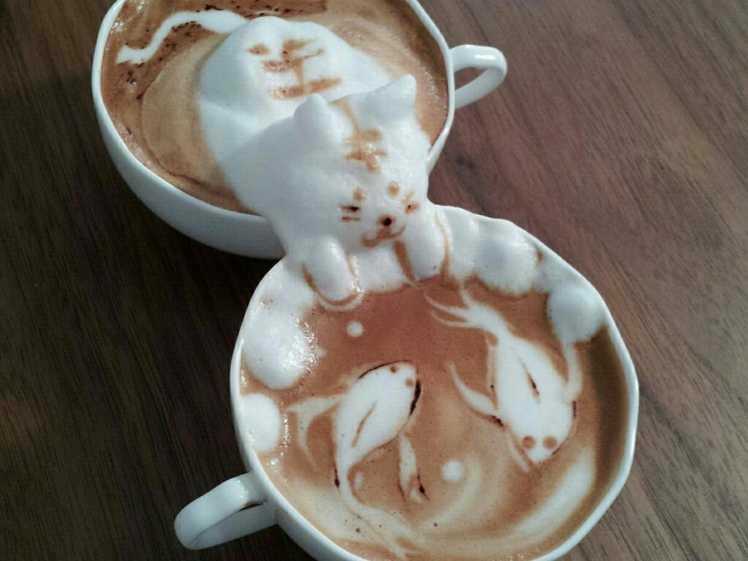 Above: the work of barista extraordinaire Kazuki Yamamoto. Using coffee that didn't come from a pod. Pods are to good coffee as fast food chicken nuggets are to actual chicken: Better than starving, some people like them, but you know deep in your heart the real thing is so much better. Valuing convenience first puts taste at a poor second. The popularity of sugary coffee-based drinks and flavored syrups suggests that many coffee drinkers aren't just in it for the taste. But while taste depends on the drinker, quality can be measured. The National Coffee Association warns that coffee beans lose their freshness almost immediately after roasting, and recommends buying in smaller amounts--enough to last a week or two. When coffee is ground, the beans get stale even faster. Ground coffee can only stay truly fresh for a few days. The beans in coffee pods are roasted, ground, and packaged, then wait in warehouses and on grocery shelves for 3-5 months before reaching consumers. Vacuum sealing and nitrogen keep the coffee from oxidizing, but the grounds still lose the flavorful (and volatile) oils, in the form of CO2. Open the pod and the flavor escapes. The New York Times worked out that each Nespresso capsule contains 5 grams of coffee. Folgers pods each hold 8 grams. Whether you choose a 6 oz. or a 10 oz. cup, the amount of coffee grounds remains constant. Nothing says "good morning!" like a nice hot cup of diluted coffee-flavored water. Research suggests that heat exposure may cause plastic to leach harmful chemicals, so maybe it isn't the best idea to regularly consume a beverage that's made by blasting hot water through a thin plastic shell. Of especial concern: phthalates and bisphenol A (BPA). Many plastic water bottles are now BPA-free as a result of overwhelming consumer concern. Keurig notes that all components that come in contact with water and coffee grounds are BPA free. However, one source lists K-cup components: a blend of polyethylene, ethylene vinyl alcohol (EVOH), and polystyrene. There are known health issues associated with styrene, which can migrate from containers into food or drinks. Long-term exposure to small amounts of styrene may lead to abnormalities in chromosomes and the lymph system, lower platelet counts, and cause fatigue, nervousness, and difficulty sleeping. Pods are changing how coffee is grown...for the worse. The use of pesticides and genetically modified crops is a global health issue, and coffee crops are no exception--both in the U.S. and abroad. In response to a growing global demand for coffee, many farmers are moving away from traditional shade-growing methods to raise "sun coffee," which compensates for losing the protective canopy of trees with pesticides and fungicides. Clear-cutting land for sun coffee eliminates biodiversity, endangers species, and has stripped 60% of the six million acres of our world's coffee farms of trees. Pesticide use may also damage coffee plants by spreading a type of fungus, which will only cause a decline in the world's supply. Most coffee pods package a blend of beans. There aren't many single-origin pods, and little to no transparency as to where beans are sourced, so there's no way to tell what you're getting. Nestlé Nespresso partnered with the Rainforest Alliance to set standards for sustainability and environmental protection, but that's the exception, not the rule. Pods are a danger to small businesses. "... unfortunately, just like a restaurant that’s busy on weekends can’t make it without at least a couple strong weeknights, we can’t make a living selling you Weekend Coffee three times a year. The guys who are left standing at that point will be the ones who sold their souls in exchange for a license to make cups for the flavor-of-the-month single-cup brewer manufacturer." The high price of low-quality coffee. Plenty of coffee pod cost analysis literature is available. Sources from Oliver Strand of the New York Times to MSN Money report that per pound, coffee pods are far more expensive than whole bean or ground coffee. How much more? By Strand's calculations, the coffee in Nespresso Arpeggio espresso capsules adds up to about $51 per per pound, and Folgers Black Silk blend K-Cups cost over $50 per pound. Compare that to most high-end coffees, which Strand rang up at less than $20 a pound. Bottom line: don't join the pod people.